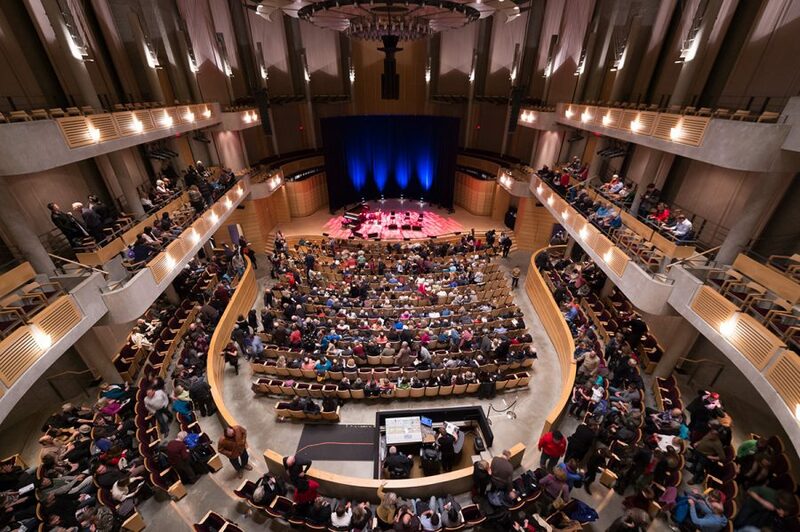 In a single week, the Chan Centre might play host to multiple graduation ceremonies, a talk between a celebrated anthropologist and a Buddhist leader, a TV shoot, a performance of First Nations spoken word, a film screening, and a high-profile concert. But what visitors don’t see is just how much equipment, skill, and ingenuity it takes to turn those creative visions into realities — and behind the scenes there is a roster of technicians making it all happen. There are walls to move, cables to run, microphones to test, visuals to display, webcasts to host, speakers to suspend, spotlights to operate, and innumerable production-specific problems to solve. There are 2,500 square yards’ worth of acoustic curtains to adjust, and a 25-ton acoustic canopy to raise and lower, from as low as 9 feet 4 inches up to 59 feet. The concert hall boasts 1,314 light bulbs, 514 of them in the canopy alone, so changes are a given. Not only does the staff have to master those tasks; they must also keep up with the times and address concerns that couldn’t have even been imagined when the Chan Centre was first designed. Riter remembers only a couple of mishaps. One came during a talk by the Dalai Lama when a stagehand accidentally knocked over a music stand and found himself instantly surrounded by security guards. The other involved two crew members who were moving a harpsichord across the stage mid-show — only to discover they only had the top half of the instrument in hand. In addition to overseeing the centre’s technical department, Co-Managing Director Cameron McGill is responsible for box-office staff, ushers, bartenders, the maintenance crew, and other operational staff.